The electronic “ding dong” of the automated doorbell chimes a greeting as you enter the tiny, fluorescently lit establishment. From the back room emerges a tall, slight Asian man, wiping grease on his apron, a huge grin across his face. “Hello!” he says with an excited, familiar laugh, his thick Korean accent blanketing his words and transforming them from a generic salutation into the warm, welcoming embrace of an old friend. If you have been to American Donuts even once before, Sam Song, the owner and operator of the shop, will remember you. Sit at one of the three sunny yellow tables for any length of time and you will witness an astounding number of people walk through the door and greet Song by name. Song, of course, waves excitedly and offers his usual laugh and “hello!” in return. When you place your order, you can always expect at least one or two extra donuts. Song is especially fond of the college crowd that typically appears throughout the wee hours of the night. While the late-night donut excursions are likely due to the generally backwards sleep schedules of college students, it would not be much of a stretch to assume that the hot, fresh donuts that emerge nightly during those same hours entice the students even further. Each night, Song bakes every donut, muffin, bagel, or other pastry, often by himself, but occasionally with the help of one other employee. Originating from South Korea, Song and his wife, Tina, immigrated to the United States 35 years ago. They have two children, a son and a daughter, who are a teacher and a dentist, respectively. Three years after arriving in the United States, Song learned to make donuts from a friend and has been in the business ever since. The work is difficult and tiresome, especially considering Song’s lengthy 32-year career in donut making. 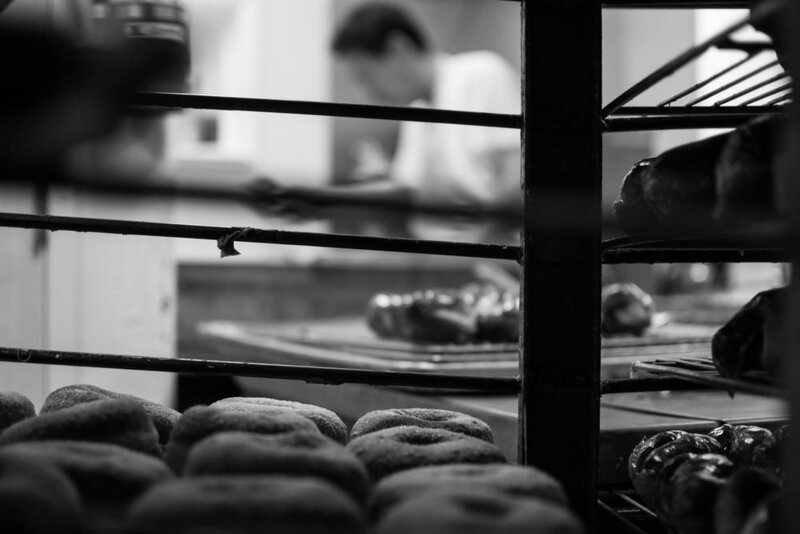 The back room contains two vats of boiling oil, two worktables, several shelves full of sugar, flour, yeast and other donut ingredients, a large sink, two ovens and several haphazardly placed racks of cooling donuts. There is hardly room for Sam alone and when his assistant is there to help him bake, the two navigate the kitchen as two dancers making their way around a donut-infested dance floor. When they need to, they communicate mainly with gestures and one or two English words, as English is neither of the two’s first language. Their expert donut dance is completed when the oil is no longer boiling, the tables are cleaned, the ovens are off and final trays of fresh glazed donuts are loaded into the front display. Song takes great pride in the care he takes to he prepare his donuts. He explained that making the donuts too crumbly or too soft is detrimental to retaining customers. If the people do not like what they taste in the very first bite, they will not come back, he says. 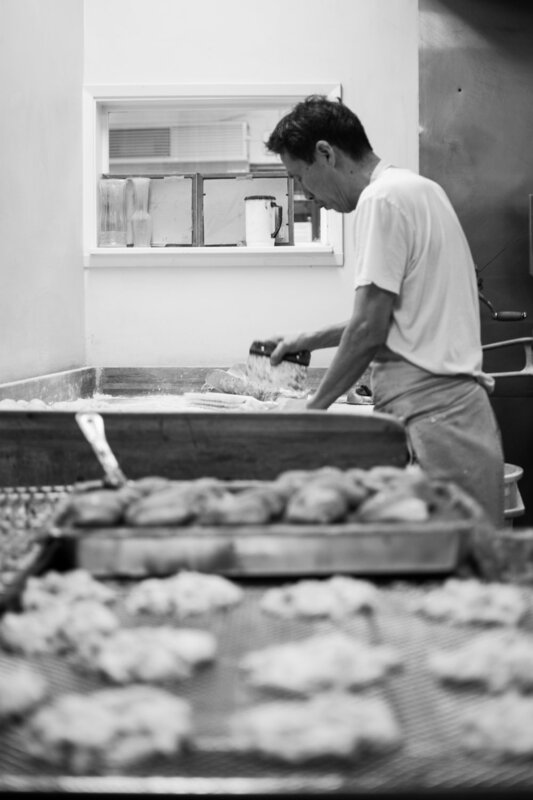 He lets them rise for the perfect amount of time and has perfected the frying and frosting system throughout the decades of his craft. Song is a beloved member of the Riverside community, as made obvious by the countless people who enter the shop with a “hi Sam!” and often a handshake or a short conversation, limited by Sam’s endearingly broken English. 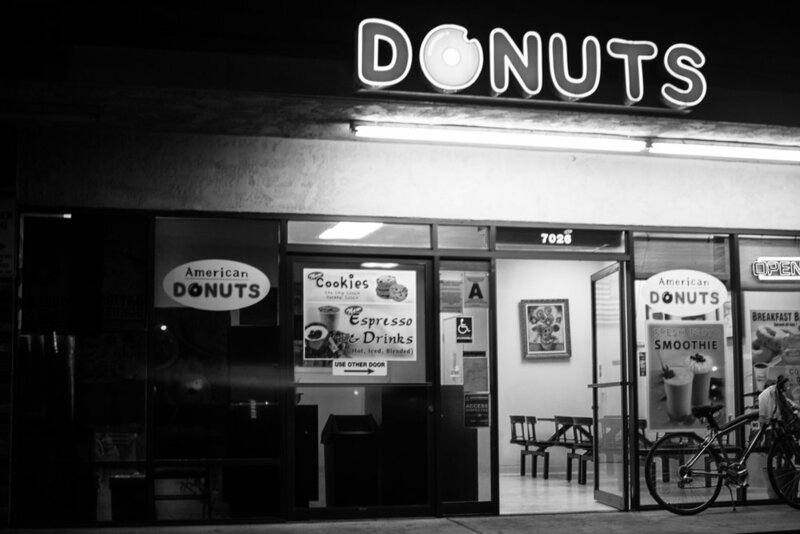 Regardless of who enters Song’s place of business, he never fails to make it feel more like a home than a donut shop.